New York: Still hot. Socks: Not yet complete. Posted in Socks, Uncategorized at August 26th, 2009. 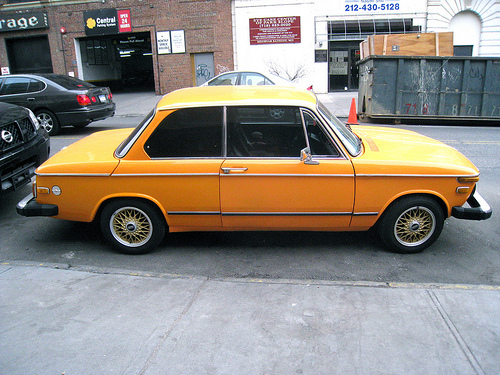 In driving news, this is a photo of one of Adam’s favorite cars, a BMW 2002. It is very cute and mod. Anyway, I show this picture because we rented a car a couple of weekends ago, and the only car Zipcar had in the lot was a BMW (though of newer vintage) and I drove it back from the far reaches of Queens back, and Adam thought he was going to die. As he is not a driving instructor, he would be like, “Now do that, you know what I mean! !” And I would be screaming back, “No! I have no idea what you mean! We’re exiting!! I can’t switch back! Argh! !” Anyway, after one treacherous highway lane change, I saw the guy who kindly let me squeeze into his exit lane laughing in my rear view mirror. I was grouchy, because, yes, I am a bad/beginning driver and yes, I am driving a BMW. Shush. In knitting news, I am still knitting my socks. I find knitting the two-socks-on-one-needle method a little boring because even though your socks are more even, your progress is SO slow, due to one row on one sock and then the other. <–This is potentially the most boring and obvious sentence I have ever written. Only thing that would make it more boring would be a Facebook quiz: What type of sock knitter are you? In reading news, I have finished Middlemarch. It was not unlike Harry Potter 7, in that after MANY hundreds of pages of suffering, all of the characters basically live happily ever after. I was like WTF George Eliot?!? I have been slogging through hundreds of pages of Dorothea’s self-righteous suffering for it to all be solved in the matter of three pages? Couldn’t this have happened on page 20?! In the middle of reading Middlemarch, I went to see Bruno with my English-major friend (now turned corporate lawyer, of course), and I mentioned that I was reading Middlemarch. He said, “I never could decide whether I liked Dorothea or not,” which I think is an apt summation of the entire book. Before Harry Potter 7 was published, I promoted my own theory to everyone who would listen: namely that Harry Potter had to give up his magical powers (or “die as a wizard”) in order for him to save the world. I think this would have been a significant sacrifice, as well as following the plot structure of every one of these monomyth books. However, J.K. Rowling decided not to listen to my awesome advice and instead go for the most bourgeois happy ending ever. Anyway. I am now reading Moneyball, Michael Lewis’s book about the Oakland A’s. This better be an improvement over Middlemarch. Posted in book reviews, Uncategorized at August 18th, 2009. I temporarily lost my blogging mojo last week, what with the heat and all. And trying to slog through George Eliot’s Middlemarch. That book is no laugh a minute. Actually it has this problem that many multi-plot novels have, I think, which is that the reader tends to only be interested in a couple of the plotlines, and frustrated by the others. For those of you who have read Middlemarch, I am halfway through and interested in the Garth storyline. Very Old-Fashioned Girl. Plotlines I am not interested include any discussion of politics. BORING. Also, I think that Celia, the catty sister of Dorothea, could do with many more scenes. (She definitely has some of the best lines in the book.) This is a book that might be improved by watching a BBC version of it instead of reading it. Oh well, I will conquer you Middlemarch. On the topic of other long-winded things, we went to see Ang Lee’s Lust, Caution at Lincoln Center last week. I thought Adam would like it because his favorite movie is Wong Kar-Wai’s In the Mood for Love, which my grandmother accurately described as “a lot of walking, not a lot of talking.” I wanted to see it because I heard the clothes in it were quite stylish (it was set in ’40s Shanghai), and it was set in a similar time period (well, “the past,” I guess–ITMFL is a bit later, probably the ’60s) and place as In the Mood for Love. (Also, both star Tony Leung.) I thought Lust, Caution was okay, but it was very very long, and at a certain point, I was like, oh my god, hours have passed, and the main character is still in Hong Kong! This movie is never going to end!!!! To quote Elaine in Seinfeld, “Quit telling your stupid story about the stupid desert and just die already! Die!” Adam liked it even less than I did and claimed it was “boring.” And that is the end of my art-house movie reviews for the week. Posted in travelingproject, Uncategorized at August 12th, 2009.